i dun know why i love bodyshop very much. This is the second time i do damages at the bodyshop this month. If previously i bought something for my essential use, this time, i was actually do a makeup haul! and, not forget to mention, bigger damaged!!! lately, i feel moody all the time. everything seem not right, messy and annoying. I feel alone, left behind, and dumb! My brain cannot functioning well, and i keep doing mistake all the time. I feel like want to scream as loud as i can... i fed up with everything. I don't know what i want, right now... material things doesn't cheer me up. Even makeup cannot cheer me up for long. i feel lonely. be a stay home mom, sometimes make me feel sick! i lost my confident, my brain, and my sensibility. I become numb, dumb, and stupid. i feel neglet, being ignore, and disrespect. My words become unimportant, and myself become invisible. i am the "orang rumah". now i am all alone by myself, alone with juwita, at home. she look at me, i look at her. 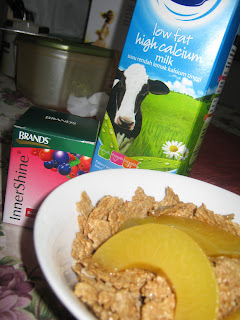 if i have to choose only 1 meal a day, i definetely will choose a healthy breakfast. Breakfast is a MUST for me. I can stay all day long without lunch. I can even sleep well without dinner, but i can't start my day without a breakfast. Healthy breakfast to me is something very important. It must have enough protein, fibre, low GI carb, enough calories for whole day, and other nutritions that my body need. ok, sambung cerita sebelum ni... ni lah dia sample2 susu yang juwita dapat. 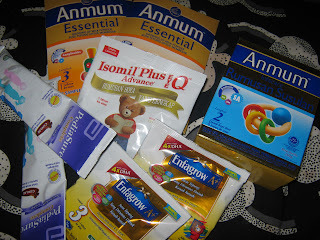 Yang doktor recommend adalah pediasure dan anmum. juwita ni, breakfast dia suka minum milo dan telur separuh masak dgn abahnya. So, bila ada sample susu ni, instead bagi dia milo kosong, ibu ni tambahlah susu sample tu dalam campuran milo dia tu. Setakat ni dah cuba pediasure dan anmum. mmm... she's not even gaining a weight since her last visit there! (oh, btw, we went to klinik adek @ sec 9 shah alam :) ) still 9kg's, which is not very gud..
later, i feel like wanna weight myself too. So i step up on that thing... n guess what? i weight 37.5kg's!!!! i thought i am 40kg! wahahahaha! then i manage to persuate my hubby to do the same. and... he measure himself 56kg's! hahaha! we are the underweight family! the lucky 5005 @ ceriterajuwita!!! we found the lucky 1!!! Previously, i announced a giveaway for my reader. 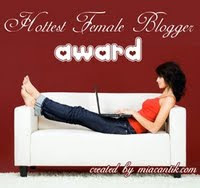 who can be lucky enough to get total view of 5005 during their visit on my blog will win a special prize! so, here it is... i already have the winner. and here is the prove of her winning. orang punya la ramai ya rabbi... bergesel-gesel dada aku dengan amoi2 kepong tuh! phew... x tahan... keluar balik. ok... orang ramai juga, tapi takde la bergesel. boleh la lagi salesperson tu layan kehendak aku. Biasala.. hari selasa kan... memang la x ramai orang. 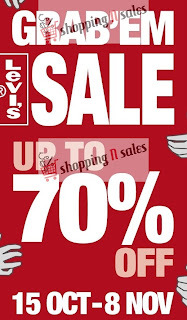 Levi’s Grab’em Sale Up to 70% Off! biar betul! ohhh... ni la masanya nak pow cik abg! hahaha! levi's babe, berbaloi-baloi dan harus beli! rasa-rasanya tiap2 sorg kena ada at least 1 jean levi's dlm lemari, baru boleh panggil diri sendiri fashionista!. i suddenly LOVE boot! anywhere i go, online or offline window shopping, my eyes are searching for 1 thing... a pair of nice boot! Talk about boots, they are many type of boots.. either ankle length or knee length, heels or flat or wedges, they comes in leatherette, suede, faux... and with many many design and pattern! 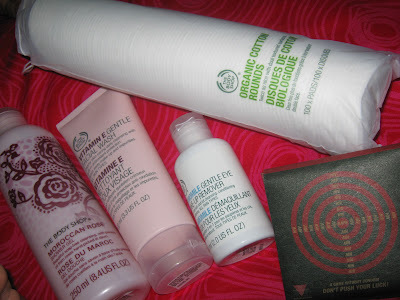 bodyshop haul - in pink! another visit to bodyshop. I visit bodyshop every month. It's a MUST! 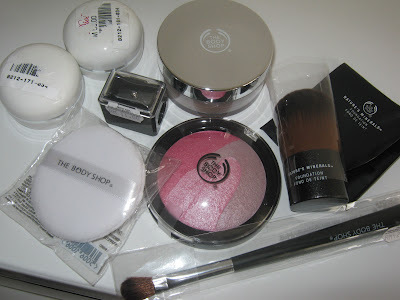 like every month i hav' somthin' to grab there.this time, i seriously need to do some damages on bodyshop outlet. most of my essentials are finished! (can u believe it? semua habis serentak!) So, here what i bought last week. tak rancang pon nak beli pink, tapi secara kebetulan memang beli yang pink-pink je pulak. facial cleanser tu mmg i pakai vitamin E punya, so, pink color la kan... shower gel pulak, sebelum ni pakai olive, tp nak try yg lain pulak... jatuh hati la kat yg pink ni.. moroccan rose. everytime pakai rasa macam feminin sangat. i loikeee!!! kebiasaannya, sarapan pagi aku mesti milo dengan biskut pingpong 7 keping. Tapi kadang kadang bila ubah selera memang best. Especially kalau ada aktiviti atau perkara penting time pagi, so terpaksa breakfast kat luar kan... my choice is always nasi lemak. Juwita pula, dia ni memang hantu makan. So tak kira lah apa saja, mesti dia makan. Sarapan pon dia suka makan nasi, dah macam abah dan atok palong dia dah perangai dia ni. 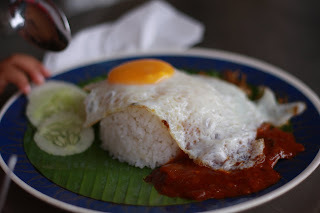 ni la dia habuan kami pagi itu...nasi lemak telur goyang. ha... goyang tak? goyang tak? sesudu nasi bersama telur.. sapa punya~~? dah lama tak masuk contest kan. Ni baru ada masa sket nak masuk, so try la masuk contest "cutest baby photo - October" anjuran bersama mombloggersplanet ni. Bulan ini, temanya adalah "Cutest baby in stroller"
i can't wait... everyday i count the day. i look at the ticker above and count again... funny! noo, i'm not crazy. i'm just too excited to our next vacation a.k.a holiday a.k.a honeymoon this October! 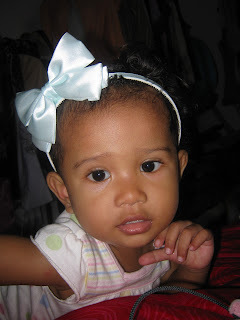 "We" (me, hubby and little Juwita) will be going for a holiday at Kota Kinabalu!!!! yippee!! Just by thinking about this vacation really make me smile and forget about all works that seem never end. Its really theraupethic and relaxing. i can imagine how wonderful and free i am during that vacation. i want to be free. my 1st "wish-lish become true" is nice and comfy bed! its a surprise! i thought he not gonna buy it coz he just bought an expensive DSLR. but, 1 night, to be exact, last tuesday, someone knocked the door, bring a set of divan complete with a spring mattress! weeee!!!! juwita is the most excited person that night. She's the person that "merasmikan" benda tuh. my hubby is a simple man. but his mind is always not so simple to expect. about a year later, he surprised me again with his unexpected mind. He sold his DSLR! i was like... speachless. 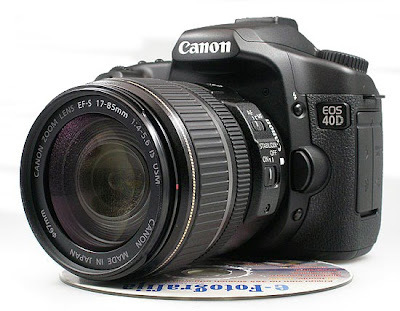 i just starting to like his dslr.. just find out that its really usefull.. i just realize that the picture taken by it was beautiful... he just simply sold it! dah lama sebenarnya makan kat sini. bulan posa haritu berbuka sekali di sini (huhuhuu... lama giler kan. dah raya pon)specialty kat sini, rasa-rasanya lah kan... (aku agak aje) ialah pilihan-pilihan seafood nya yang banyak dan mengancam. 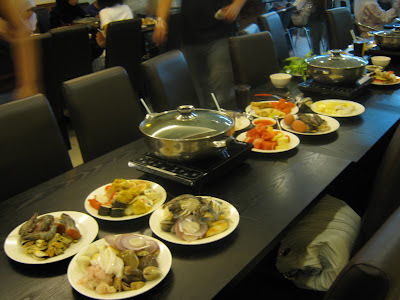 Menu pulak, dah nama steamboat kan.. ape lagi? steamboatlah! makanan dihidang seara buffet. so, untuk steamboat ada bahagian bebola ikan dan segala tok nenek benda bulat2 tuh, then ada bahagian seafood. Yg seafood tu lah yg mengancamnya. Ada udang, ketam, scallope, sotong, ikan, kerang, lala, lokan, dan macam-macam lagilah! Selain tu ada juga bahagian sayur2.. mmm sedapp jugak. I LOVE sayur! thank alot! anyone else want it? very easy 1 laa..